Day 1: Millers River Rafting - Experience the excitement of this full-day class II-IV trip, only available during the spring as you raft down 8 miles of whitewater. We'll stop for a warm lunch on the side of the river halfway through, after tackling the biggest rapids of the day. Overnight: Yurt Lodging - Spend the night bundled up in our cozy Yurt. The furnishings are simple with a double bed and a battery powered lantern, but the sight of the stars overhead through the clear skylight makes a stay in the yurt memorable. For Ziplining: Wear comfortable clothing appropriate for the season, but avoid loose clothing that could tangle in ropes or other gear. Skirts should be avoided. In late fall or winter months, it is better to come with too many articles of clothing than to come with not enough. We go in the rain, so come prepared with rain gear if needed. For Glamping: The Yurt is a one-room, circular tent with a double bed (linens included), a battery-powered lantern and a propane grill, and a comfortable porch. Some basic cooking utensils for the grill are provided, but feel free to bring your own. There are coin-operated showers located in the bathhouses near the campground. Please bring quarters with you, as we do not have a change machine. The Yurt is a 3-5 minute uphill walk from the parking lot, and the bath houses are also within walking distance. The paths through the campground are not lit, so please remember to bring a flashlight. We can take adventurers as young as 12 years old out with this package. All guests must be between 70lbs and 250lbs. Absolutely! Give our office a call at 1-800-532-7483 and we would be happy to help you customize your package. Whether you want to reverse the order of the activities, book a different lodging option, or check availability for a group, we'll help you figure out the perfect trip. For standard packages, the rafting trip on Day 1 starts at 10:30 am. Check-in for the Yurt is after 2:00 pm, so you can check in once you're back from the rafting trip. Check-out for the Yurt is at 10:00 am, so make sure you've checked out before heading to your zip trip. Start times for the Zipline Canopy Tours vary, so make sure you check your confirmation for your trip's start time. Sign up for a two day, adventure-filled getaway. You'll fly through the trees and paddle through big waves on the Millers River with this package. Day 1: Millers River Rafting - Experience the excitement of this full-day class II-IV trip, only available during the spring as you raft down 8 miles of whitewater. We'll stop for a warm lunch on the side of the river halfway through, after tackling the biggest rapids of the day. Overnight: Yurt Lodging - Spend the night bundled up in our cozy Yurt. The furnishings are simple with a double bed and a battery powered lantern, but the sight of the stars overhead through the clear skylight makes a stay in the yurt memorable. 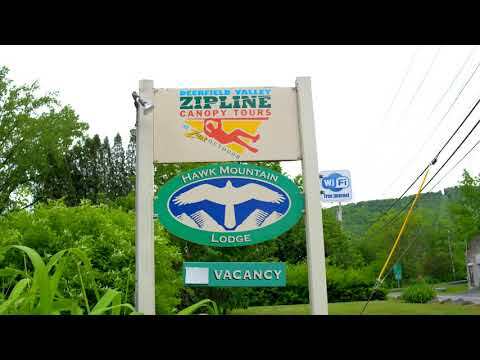 Day 2:Zip Line Canopy Tour - Start your morning with a three-hour tour through the trees. The trip includes 11 zips, two sky bridges, and 3 rappels. Don't forget to read your confirmation letter (there is a lot of useful information in there!). Call our office if you have any additional questions. We're always happy to help.